Sunday 19th August was a sad and painful day for Rahul Jajoo's family, friends and colleagues, as he passed away in his garage while trying to change the oil, the car fell on him (possible that carjack gave up) and lost his life. Parameds confirmed he was dead on arrival. Rahul was 30 yrs old with 27 yrs dependent wife Rani (Pratima) and 13 months infant Rihan. The little one still smiles at Men thinking its his dad. Lil'l doesnt know his dad is no more. Rahul supported Organ and Tissue donation helping others for a second chance in beautiful life. 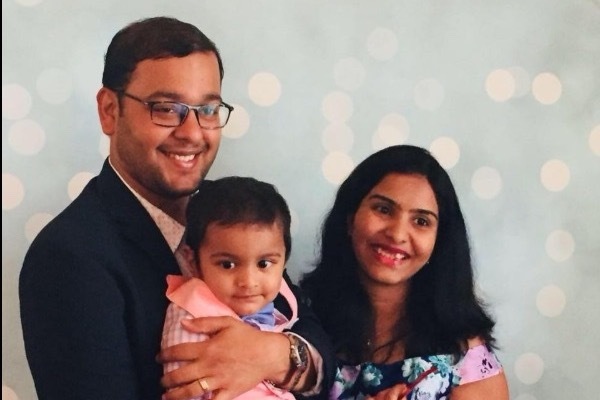 Let's together help Rahul's family in this tough time. We are starting this campaign to help the dependent mom and 1 yr son to see through this difficult phase and also help them in repatriating to india so Rani can resume her life with some financial support. Thank You all for your support and Generosity. Please spread the message as much as possible.